This summer, 2014, I will be sharing a cycling adventure with Chris, Stacia and Joe. 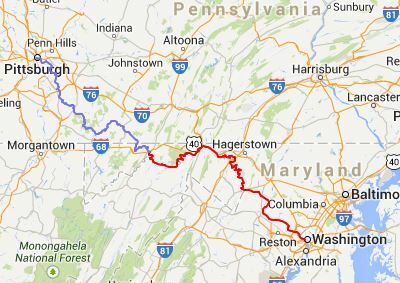 We will bike the GAP and C&O trail from Pittsburgh, PA to Washington DC. It stretches 350 miles, with the first half along an old railroad bed and the second half on a canal tow path. They join in Cumberland, MD. We will carry our own gear and be self-supported for the seven day ride, but will spend the nights in the comfort of B&Bs in small historic towns along the way. You can visit my journal page for a daily description of the ride and some supporting pictures. Additional pictures will be available on the gallery page of my website. The Journal page will display the most recent post. If you click on its title, the post will open in a separate page and allow comments and navigation to previous posts. You can also select a particular date on the calendar to view its post. There are statistic summaries and links to recent posts and related websites. Cycling statistics will be captured with a Garmin bike computer, and you will see a summary of those in the posts and in the sidebar. For those who are interested in cycling details, a link in the summary will bring you to the Connect.Garmin website to see more information. One nice feature that you might enjoy is expanding the map view and zooming into the satellite view to see the terrain we cycled.